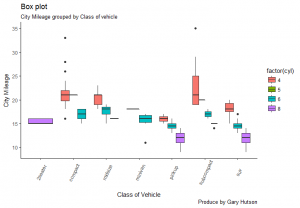 The box plot, in ggplot2, can be really powerful and useful for analysing variation. 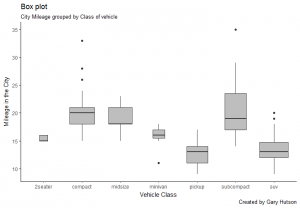 I will show a few examples of different types of box plots in ggplot2. 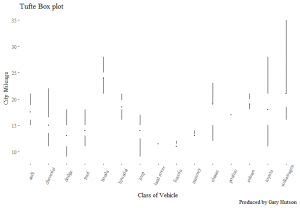 The plot placeholder has been created and we use the mtcars dataset and specify the class and cty variables of the data frame. All that is different is the geom_boxplot(aes(fill=factor(cyl))) line has the fill set to a factor of the number of cylinders in the car. Personally, I prefer the native box plots over Tufte’s theme, but as I always say it is a mere case of personal preference.